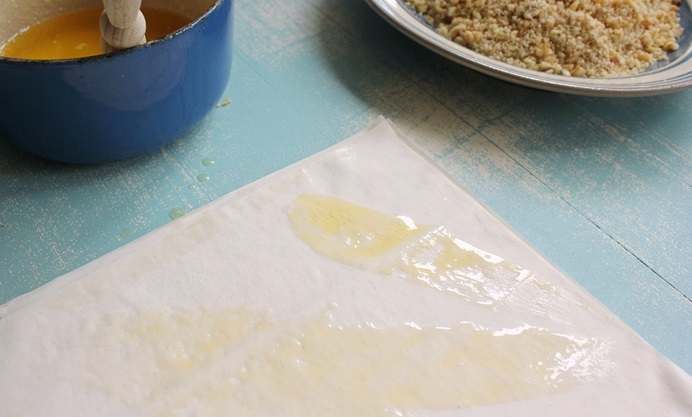 Chloë shares her family recipe for this sticky-sweet Greek delicacy; layers of crispy filo pastry and finely chopped walnuts, all coated in a rose-scented syrup. There are few things more irritating and inspiring for a teenager than the knowledge a parent engaged in wilder behaviour than they are ever likely to. I know this because, as a teen, I remember repeatedly asking my mum to recall the story of the time she sold her blood to afford the ferry home from Greece. As a student, my mum travelled the Greek islands with her friend Jane. The short trip provided some of her most outrageous stories, accompanied by joyous, golden-hued photographs of her chowing down on giant beef tomatoes and sipping tea from a porcelain cup, her left arm bandaged from the profitable sale of her type A. I found Mum’s holiday diary from the trip not long ago. Inside, written in pink felt tip, are original recipes for moussaka and baklava, two Greek classics that, for a twenty-something in the early seventies, must have seemed the most exotic and delectable dishes imaginable. 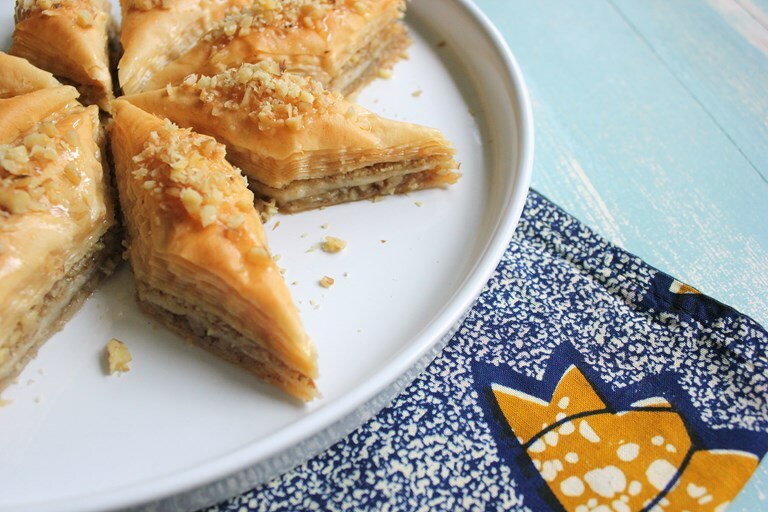 Baklava, the teeth-itchingly sweet delicacy of the eastern Mediterranean, can be made with pistachios or almonds, but in Greece it is commonly filled with walnuts. My mum’s recipe calls for puff pastry – an abomination, presumably necessitated by the fact you could not buy pre-made filo pastry in 1970s New Malden. For many things we should now be thankful for. Mum’s recipe is beautifully simple, however, and has provided the backbone to my version, which forgoes popular spices such as cardamom, clove and cinnamon to let the flavour of the walnuts sing out from between fine layers of filo steeped in honey-like syrup scented with rose water. 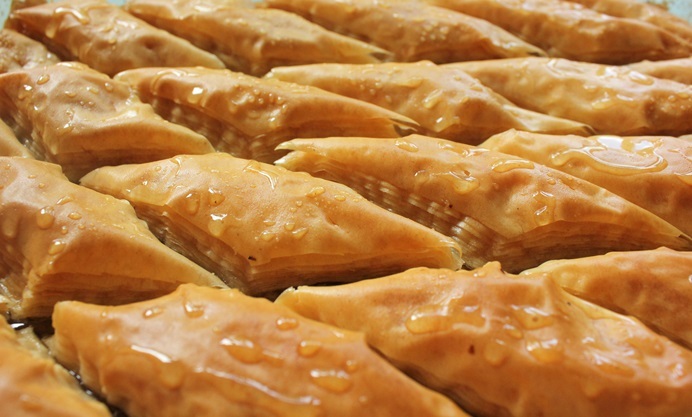 If you can get hold of Greek filo I find it superior to the more popular UK brands. 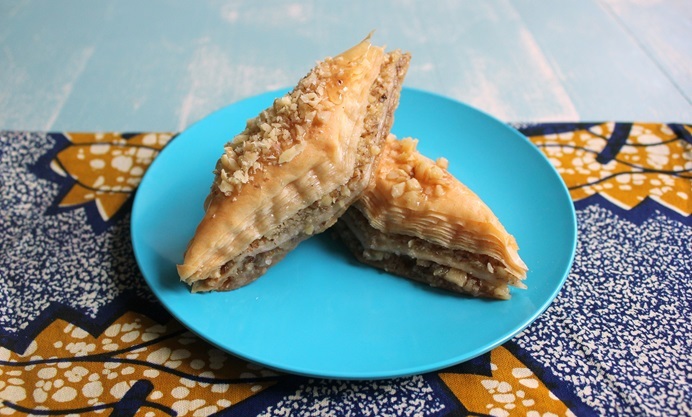 The pastry is finer and holds its layers better, resulting in a puffier baklava with more defined layers and a lighter texture.